A modern burial is one of the challenging activities to manage in the historic Silver Terrace cemetery. As an old cemetery we don’t have much space and the CCF is not in the burial business. However the local government wanted to offer modern burials whenever possible – ah well, we all know that historic preservation is often an exercise of compromise. There are rigid requirements concerning who and how people can be buried in what is really choice real estate. Our job is to facilitate those burials in a way that is not harmful to the historic status of the cemetery and in compliance with the various organizations that maintain sections in the cemetery. We ask for burial donations which are applied to restoration projects. Other activities such as monitoring and excavating work are assigned to approved suppliers for which the family pays separately. Whether required or not by grant givers, it is the policy of the CCF to adhere to the National Park Service’s guidelines for the Treatment of Cultural Landscapes. We are in a National Landmark, and as such it is our responsibility to comply with accepted preservation principals. In many cases we could lose valuable funding should we not adhere to those principals. One of the most difficult issues we must address is the suitability of a modern grave marker; what is “right” and what is “not acceptable.” Remember the NPS’s treatment plan represent guidelines, not rules. At the CCF we have had to take those guidelines and use them to develop rules in order to literally protect our funding and the integrity of the landscape. The following is a summary of some of the information we used to develop our rules and make decisions on “non-standard” requests for grave markers. There may have been mistakes made in the mid 1900s, but our job is not to continuing making those mistakes. When alterations to a cultural landscape are needed to assure its continued use, it is most important that such alterations do not radically change, obscure, or destroy character-defining spatial organization and land patterns or features and materials. The installation of additions to a cultural landscape may seem to be essential for the new use, but it is emphasized in the Rehabilitation guidelines that such new additions should be avoided, if possible, and considered only after it is determined that those needs cannot be met by altering secondary, i.e., non character-defining, spatial organization and land patterns or features. If, after a thorough evaluation of alternative solutions, a new addition is still judged to be the only viable alternative, it should be planned, designed, and installed to be clearly differentiated from the character-defining features, so that these features are not radically changed, obscured, damaged, or destroyed. The grave marker is part of the material culture of the landscape. We have evaluated the grave markers in our historic cemetery for materials used, designed shape, and graphic engraving. Quarried stones-limestone, sandstone, granite, and marble. The quarried stone used was typically lighter in color, white-gray tones, and came from other areas in the country. Local unrefined “rock” and cement was not used. Bronze, White Bronze was used, but generally not iron materials. There were two historic blacksmith created grave markers, but these were exceptions and not prevalent at the time. Wood was used, but as one might expect, it has deteriorated and is no longer abundant in the cemeteries. How these observations translate into a modern policy is pretty simple. The modern grave marker must be made of: marble, granite, limestone or sandstone (the last two are not widely used today due to stability). White Bronze is no longer produced and no “home made” iron work for markers is appropriate. Wood, while in keeping with the character, is a modern maintenance concern and therefore it is not permitted. Local rock for markers is not allowed. The shapes of the historic marker were fairly standard; door-shaped, rectangle, obelisk, and symbolic carved statuary such as a cross. Marble was typically used when a statuary element was desired. For our application, this means that those same shapes are acceptable today: door-shaped, rectangle, and obelisk. For the most part, crude unfinished shapes, stars, and circular designs would not be acceptable. We prefer flat mounted markers from a maintenance standpoint. Flat mounted markers also tend to be less distracting in a historic cemetery, however upright veteran markers are acceptable. Wood is not allowed due to maintenance issues. The historic epitaph typically contained name, birth and death dates, family relationship, and a brief saying or poem. The graphic elements were always symbolic in nature; the wreath, the Forget-me-not, cross, Star of David, and other Victorian symbolism meaningful in the deathways of the time. There were no cartoon shapes. The overall impression of the historic cemetery is monochromatic in nature both then and now. There were neither bright colors used nor decorative “glued” add-on elements such as beads or buttons. On rare occasions (due to expense) there may have been a porcelain transfer photograph adhered to a pre-carved stone. But even that add-on was black and white. There was no metal used or reflective material of any kind. We evaluate the modern engraving in relation to the historic nature of the grave markers. Again, in crafting our grave marker rules, we take our cue from the historic material culture; no bright colors, no cartoon shapes, no inappropriate images and/or writing, and no reflective materials. This includes solar lighting and battery operated lights. We do allow professionally transferred photographs on appropriate stone, both flat mount and upright. It has been a long journey for the cemetery and for us. We have followed these rules for nearly 20 years in order to protect the historic material culture of the landscape. The majority of families that are allowed to bury in this historic landscape consider it a privilege and are more than happy to help us retain both the integrity and our funding. When I was asked if I might write a blog about photographing the cemetery I jumped at the chance! My mind is whirling with all of my experiences there as a photographer that I will try to put into print for you. I’ve been walking the cemetery paths for the past eighteen years. First with Boo’s leash (my dog) in my hand and after Boo sadly passed away I held a little Canon point and shoot camera for a while. Encouraged by my big sis to pursue photography I advanced to a larger Canon dSLR camera and the Canon and I pretty much cut our teeth with cemetery photography. The cemetery is beautiful and changes her appearance with the light, the seasons and the things that happen out there. I’ve captured some of the most devastating images along with the most joyful images with my camera in the Silver Terrace Cemetery. The devastating? Well, those images are the ones where I have stumbled upon a toppled stone that I’ve admired for years. I look at the beautiful grave marker crumbled to the ground and sickness fills the pit of my stomach. Even though some on our cemetery board are experts in restoring shattered stones, sometimes they are beyond repair. Will I ever lay my eyes on the beauty of that Victorian marker standing in place again? Then I raise my camera to my eye and capture the sad scene to record the vandalism. Now for the joyful! One scene stands out boldly in my mind. It was sunrise; a morning after a heavy storm and I trudged through a foot of snow with deeper drifts out to the Catholic section of the cemetery. 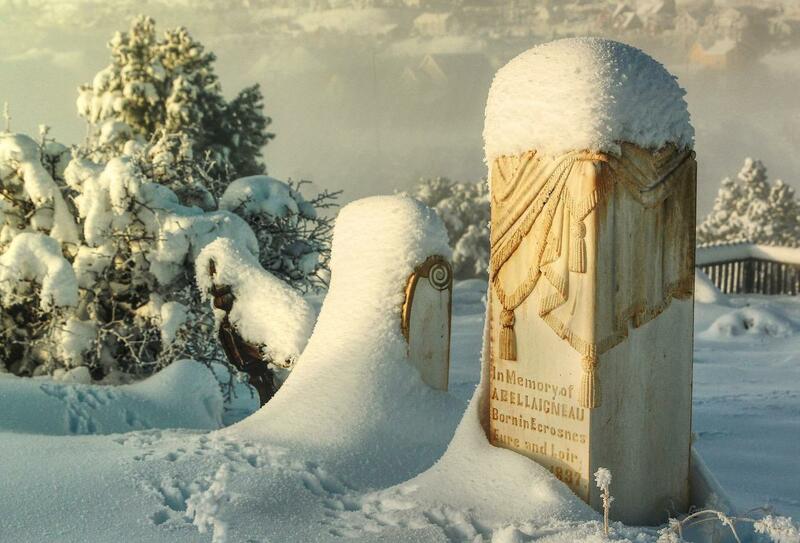 A bit of mist moved in, accompanied by light snow and the sunrise gently glowing against the marble gravestones. It was unbelievable, the most beautiful light I have ever seen in my life and I stood there and wept tears of joy at what I was witnessing. Quickly I raise my camera to my eye to record that moment in time of the winter scene. In a few seconds the light changed and the scene fades into only a memory but is happily captured for the future on my little digital card. The wildlife in the cemetery is another interesting and hard to capture option for my camera. Usually the critters are pretty wary of the woman with the black box but every so often I catch them unaware. A bluebird on a lantern, a coyote on the mine tailings, a bobcat, a quail, a newborn foal, or a skittish cottontail that I was somehow able to get close to with my not so long telephoto lens. All is exciting stuff out at the cemetery for this Comstock photographer! I’ll sign off now. After all, I was asked for a blog, not a book! But it’s hard to stop my words because these are subjects that I’m passionate about, both the cemetery and photography. Tomorrow I’ll be walking the cemetery paths again. Patiently watching and waiting in that hauntingly beautiful place for the next great photo!